Cleo Queen of Egypt Slots is a 5 reel 9 payline video slot game released by Cryptologic in July 2009. The slots incorporates sophisticated design with Ancient Egypt theme. The game features a Progressive Jackpot, Bonus Game with cash prizes and Multipliers, wild and scatter symbols. You can play the game in a no download version in any Cryptologic instant casino. 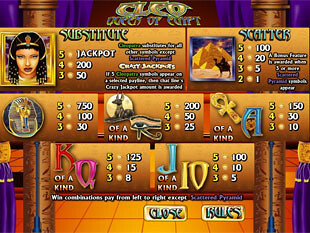 Cleo Queen of Egypt presents the following reel icons that constitute 34 winning combos: Pyramids, Cleopatra, Sarcophagus, Anubis Statue, Eye of Horus, Ankh and high cards: Ace, King, Queen, Jack and Ten. The minimum coin denomination starts at $0.05 and reaches up to $5.00. The maximum total bet with all paylines covered constitutes $45.00 and the minimum one – $0.45. If you want to hit the biggest jackpots, play with the maximum coin value. 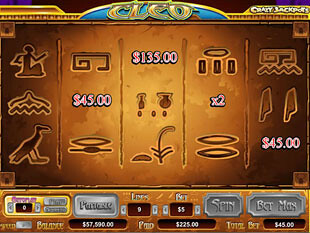 The highest Cleo Queen of Egypt jackpot is 750 coins or $3,750 for 5 Sarcophagus symbols. 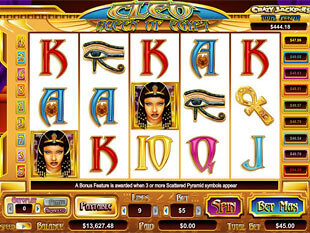 The second Cleo Queen of Egypt jackpot is 200 coins or $1,000 for 5 Anubis Statue, Eye of Horus, or Cleopatra symbols. 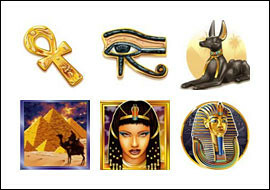 The third Cleo Queen of Egypt jackpot is 150 coins or $750 for 5 Ankh symbols. Cleopatra is a wild symbol and she can substitute for any icon to complete a winning combination. Wild Cleopatra can bring you the progressive jackpot if you manage to collect five wilds on an active payline. The wild cannot substitute only for a scattered Pyramids symbol. Pyramids is a scattered symbol that awards you large multipliers and a bonus game. Triggering 5 Pyramids symbols, you get a prize worth of 100 total bets. If you triggered 5 scatters with the maximum total bet of $45.00, your prize will make up $4,500. 4, 3 or 2 scattered symbols will award you 20x, 5x and 1x Multiplier. Dropping more than 2 scatters activates the bonus game. Bonus Feature. The feature can be started the moment you catch 3 or more scatters. On the screen you will see a stone wall with 15 ancient Egyptian symbols hiding cash prizes and multipliers. Click on the symbols and reveal your bonus prizes until you come across a trap. One of the symbols contains a trap. Once you click on it, the bonus game will be over and you will turn back to your main game. Hit the crazy Progressive Jackpot by triggering 5 Cleopatra symbols on the selected payline. You have 9 paylines and 9 different sums of the progressive jackpot. Your jackpot sum depends on the line where you drop your 5 wilds. The jackpots are constantly growing and you can see the total jackpot sum on the ticker above the reels. At the right of the screen you can see 9 tickers displaying the sums of the current jackpots. Cleo Queen of Egypt Slots slot machine is an engaging Egypt-themed game with 9 progressive jackpots, bonus feature, wild and scatter symbols. If you want to take a look at the attractive Queen of Egypt, spin the reels of this absorbing slot machine and hit the largest jackpots.